When Christine Boehlke steps outside and turns her face to the sea, it's like standing on the bow of a ship, with wind in her face and the sea straight on. In fact, she's elevated off the top-floor living room of her three-level, boat-shaped home. 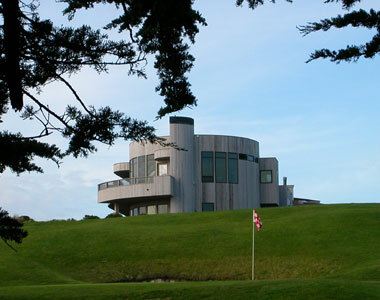 Among the uniformly tasteful, architecturally restrained homes of the Bodega Harbour development, the house stands with the grand presence of the Queen Mary. The owners of a San Francisco public relations firm that specializes in the high-tech industry, Boehlke and her husband, William, have delighted in this shapely abode for about two years. And even after facing that virtually unbroken view for so many sunsets, she swears she never fails to notice its beauty, which, through massive picture windows, wraps around three sides in cinemascopic magnitude.
" I never take it for granted," she says, heating water for coffee on a stove that faces the sea." The cooking area is set into a warm cherrywood counter that also curves like a bow, an echo of the east and west outer curves that anchor the house on either side like a ship. So even while cooking, the sweep of the Sonoma Coast, from Point Reyes to the south to Doran Beach to the north, is constantly compelling. 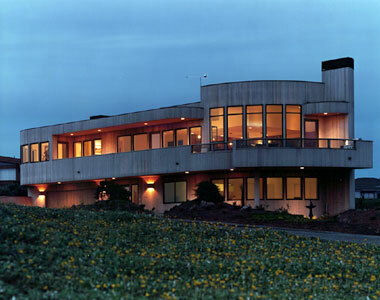 "This 3,100-square-foot home is the creation of David Kingwill, an architect whose penchant for the curvilinear edges reminiscent of Art Deco has been applied for some 23 years at Bodega Harbour, an ocean view subdivision built around a golf course where building guidelines are detailed and strict. Over more than two decades, Kingwill has designed 10 homes in the up-market subdivision, and many feature the rounded edges that have become his trademark. It's a look that is also reflected in his commercial designs, including the Sonoma County Water Agency Operations and Maintenance Center on College Avenue in Santa Rosa, a project that earned him a certificate of merit from the city. That sensibility appeals to the Boehlkes, who have a deep appreciation for art in its many forms.
" I am very much an abstract person," Chris says. "Curves are about openness, big pictures, palettes waiting to be written on. It's all about swoops and curves. With angles you come to an end and you have to turn. It's like a Mobius strip. It keeps going and going and going and nothing gets in its way." Kingwill designed the house with its cedar siding and abundant use of glass blocks for another couple, who after only one year were transferred to New England. The Boehlkes moved in about two years ago and are as enthusiastic as if they had collaborated on the design themselves. While it trades windows for the kind of wall space that is appreciated by art collectors like the Boehlkes, whose large collection focuses on Sonoma County artists, Chris Boehlke says the sacrifice is worth it.
" This is almost a piece of art itself. You walk in and feel at home. We like art and we like design, whether it's paintings or flowers. It all starts with nature." who had another house in the harbor that was more of an A-frame design and not blessed with the sweeping views, tooled past in their car and waved to the owners, calling "Nice house." They never imagined it was soon to be theirs. The Boehlkes have added their own touches. The entire house is colored with delicate, Japanese-inspired flower arrangements that Boehlke creates from silk and fresh blooms she buys from a grower in Salmon Creek.
" During winter I'm doing 28 to 30 vases a week," she says. Everywhere one turns in the home there are curves instead of angles. The Plexiglass hood over the downdraft fan in the kitchen gently bends downward. 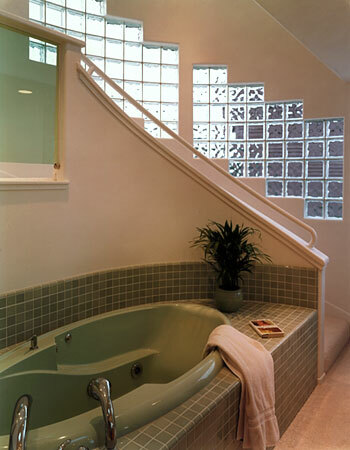 Even the master bath is set off at a different level from the bedroom, down a curvy staircase lined in geometrically set glass block windows. The sage green tub is oblong and the tile and glass block shower is open, yet curves like a snail, providing privacy without the need for a door or shower curtain. The house created particular challenges for Kingwill. The lot, while one of the largest in the neighborhood at 12,000 square feet, is also an odd triangular shape. 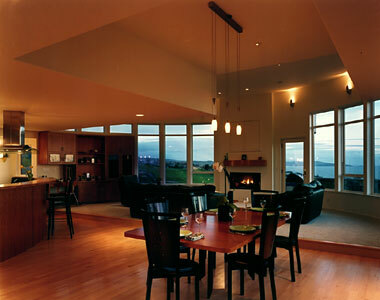 Kingwill was determined to maximize the square footage and the views within the strict height and footprint limitations placed on all development within Bodega Harbour. The main living area—the great room, a master bedroom and an office—were situated on the third floor rather then the customary bottom floor. This, says Kingwill, "allowed for improved views over existing homes in the neighborhood, as well as some privacy from the street." The living area features different levels and ceiling elevations, all of which add interest to the interior while serving a very pointed function. Homes can be a maximum of only 16 feet high in The Harbour. But the building guidelines offer a 20 percent height bonus when a corresponding part of the house is less than 16 feet high. Kingwill labored, borrowing height wherever possible, banking the savings and blowing it out where it seemed to matter the most. Many of the smaller spaces have only 8-foot ceilings.
" The height bonus was allocated to the living and dining areas," he explains, "creating a crescendo of windows and space oriented toward the best views. The kitchen area partakes in this vista, and although the kitchen area has an 8-foot-high ceiling, the open plan allows for the whole design to breathe and feel spacious." Sinking the master bathroom down to another level was another one of those "sacrifices'' to buy more height in the living area. But Boehlke said you would never know it's a compromise because it's so appealing visually.
" I didn't ever know there was a code thing," she marvels. "I just assumed it was done for a reason, and everyone loves this bathroom. I love this bathroom. I love the whole space," she says. The strict building and design guidelines make it a challenge for architects working in Bodega Harbour. Only a few, Kingwill among them, are schooled enough in the rules to work in the development on a regular basis. The vagaries of the coastal climate also demand that certain materials be used. Redwood, for instance, doesn't work as well for either siding or decking. The house is covered with 1-by-4 inch vertical cedar siding. The deck is a synthetic material, Elastomeric, that Kingwill says is like rubber and applied in three coats.
" You wouldn't want to put in a redwood deck out there, where water leaks through to the ground below," he adds. The dramatic views and easy flow of the space make it comfortable for entertaining, something the Boehlke's do frequently. The guest rooms are on a lower level, giving both the hosts and their visitors an extra measure of privacy. But whatever the amenities, it all boils down to the light and the views. Skylights in every room frequently bathe the house in moonlight at night and, even when the clouds move in over the bay, keep it bright. impossible dream of having the view unobstructed and all to herself.
" But you get used to the houses," she smiles, gazing out over the roofs from her upper deck aerie. "They just drop away."